"the number of young people claiming Jobseekers' Allowance nationally has increased by 60 per cent since May 2010, in the Northeast that figure is 263 per cent"
A Conservative MP has written to the Chair of the UK Statistics Authority to complain about "factually inaccurate" claims made by the Shadow Business Secretary in a New Statesman article. Chuka Umunna said that the number of young people claiming Jobseeker's Allowance (JSA) has risen since the election. The Conservatives say that number has actually fallen. Mr Umunna's claims are inaccurate; they don't refer to the overall number of young people claiming JSA, just to young people who've been claiming for at least a year. 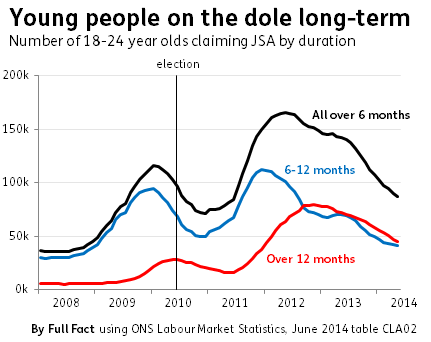 Overall, fewer young people are claiming JSA now than at the time of the election. We've asked Labour if they will secure a correction in the New Statesman. The number of young people (aged 18-24 in this case) claiming JSA has fallen by 38% since May 2010, or 164,000 people. In the North East, there are 27% fewer young people claiming JSA, a fall of 6,300 people. Universal Credit will replace income-based JSA over the next few years, and for now claimants of the new benefit aren't included in the figures. This doesn't significantly affect the figures yet, but as the rollout continues across the country, the ONS plans to make adjustments to account for this. Labour have confirmed to us that Mr Umunna meant to refer to the number of young people who've been claiming for at least a year: there's been a 60% rise since the election. At the same time, the number of long-term claimants is now falling. This has been happening since 2012. The number of people claiming for periods less than 12 months is also falling, suggesting there may well be further falls in the numbers claiming for over a year further down the line. It's worth remembering amidst all of this that the measure itself isn't the best available. JSA claimant figures are often presented as if they show the number of young people who are unemployed. They're certainly indicative of this, but there's a separate measure using the Labour Force Survey that measures unemployment directly. That shows that the number of young people (aged 16-24 in this case) unemployed has fallen by 77,000 since around the time of the election - a fall of 8%. There are still more young people who've been unemployed for over a year: 31,000 more than at the time of the election or a 15% rise. Again, this has followed a broadly downward trend since 2012. Are nine out of ten Scots a burden on the state? 'Inconvenient truth'? Has the UK's welfare bill grown sevenfold over the past half century? Have long-term jobless youths tripled in one year?